UFW Stories: "You Need to Take Leadership"
"You Need to Take Leadership"
In the summer of 1969 I visited Cesar Chavez in Delano. I was 21 years old Jewish girl from small-town Indiana working for Migrant Legal Services in South Florida as a community worker. Unofficially I was supporting a farmworker leader to organize, then unionize, farmworkers there, in part by publishing a newsletter, Nuestra Lucha (Our Struggle). On a vacation road trip I spent a few days in Delano to help out. 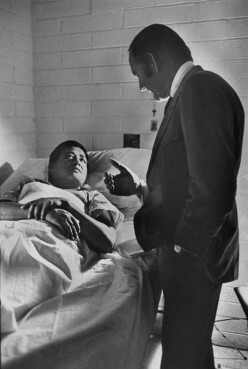 Mr. Chavez graciously received me at his bedside; he was recovering from a hunger strike. We talked for 20-30 minutes. He asked me many questions about the workers’ situation in Florida and I, as assigned, asked him to come to Florida to fire up the migrant and other farmworkers. He insisted that I must take more leadership in the cause. I raised lots of objections: I’m young, I’m white, I’m a woman, I’ve never been a farmworker, etc. He insisted that these were not impediments, that I had the talent and skills to be a leader and that it was my responsibility to use them. I was thinking, but did not tell him, that I was afraid to take the risks that he and Dolores Huerta had. That I was not able to envision a life without having children, and that I’d read how much Ghandi’s children resented his work and felt neglected by him. I went away feeling honored by his confidence in me and burdened by the heavy responsibility he’d laid on my shoulders. Most of all, though, I felt guilty knowing that I’d never live up to his expectations. I still feel guilty, still think about those moments in Delano. I never became a leader in the farmworker movement, but I did go on to be a minor leader in my adopted city of Milwaukee, where I’ve worked for more than 40 years on civil and human rights issue. I hope he would not be too disappointed in me.